You may not know how to answer that. But there are more people in your Oikos than you probably realize. Have a spouse? Have a friend? Have parents? Brothers? Sisters? Co-workers? Classmates? Regular customers? Clients? All of these people are in your Oikos. Everybody has one. Every one of us has people who we have influence with, people who will look to us for advice in hard times, or will ask us questions about our faith, or who will hope that we are praying for them when they are sick. For a more technical definition, Oikos is an ancient biblical word for “household”. It may also be translated as “your community” or “your network”. The value in this word is that each of us has a community in which we have influence. It is through this community that we purposefully discern what God would have us do as Christ-followers or those seeking what it means to become a Christ-follower. It’s our desire that a disciple (those striving to be Christ-like) would embrace a lifestyle that is holistic. 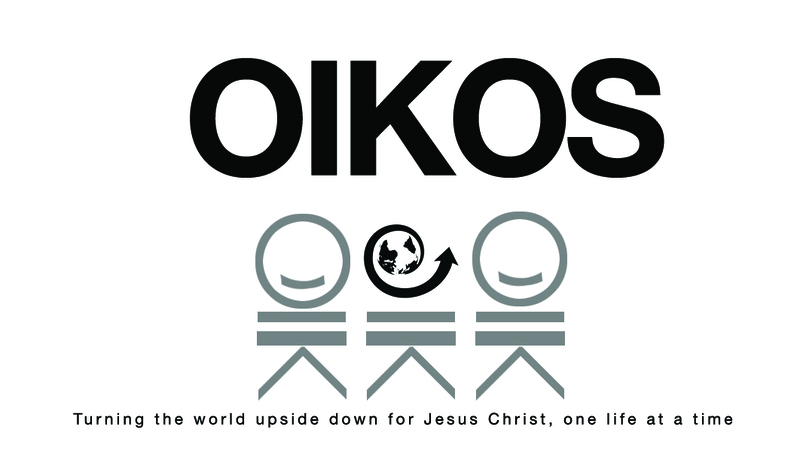 And the very idea represented through oikos is that our lives as Christ-followers would not be compartmentalized. In other words, we would not be a Christ-follower on Sunday and something completely contrary to that as we engage with our family or co-workers or classmates during the rest of the week. By living this lifestyle, our very lives reflect an image of Christ through us to the people who would know us better than anyone! It is this holistic model of discipleship, being lived throughout each one of our oikos’ that, we believe, represents the most powerful model of what it means to be a disciple of Christ. This is how we collectively embrace “turning the world upside down for Jesus Christ, one life at a time”—beginning with our own.